For centuries, people have relied on rainwater harvesting to supply water for household, landscape, livestock, and agricultural uses. Before the advent of large centralized water supply systems, rainwater was collected from roofs and stored on site in tanks known as cisterns. With the development of large, reliable water treatment and distribution systems and more affordable well drilling equipment, rain harvesting was all but forgotten, even though it offered a source of pure, soft, low-sodium water. A renewed interest in this time-honored approach of collecting water has emerged in Texas and elsewhere because of escalating environmental and economic costs of providing water by centralized water systems or by well drilling. The health benefits of rainwater and potential cost savings associated with rainwater collection systems have further spurred this interest. 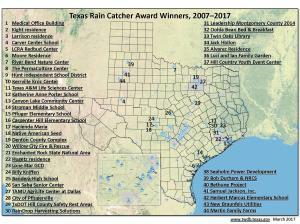 Texas is one of only a few states in the nation that has devoted a considerable amount of attention to rainwater harvesting and has enacted many laws regulating the practice of collecting rainwater. Texas Tax Code 151.355 allows for a state sales tax exemption on rainwater harvesting equipment. Texas Property Code 202.007 prevents homeowners associations from banning rainwater harvesting installations. Texas House Bill 3391 requires rainwater harvesting system technology to be incorporated into the design of new state buildings and allows financial institutions to consider making loans for developments using rainwater as the sole source of water supply. For in-depth descriptions of rules in Texas and other states, visit the National Conference of State Legislatures.